We average about 150 people per game, and playoffs and Super Bowl the numbers are 400+. 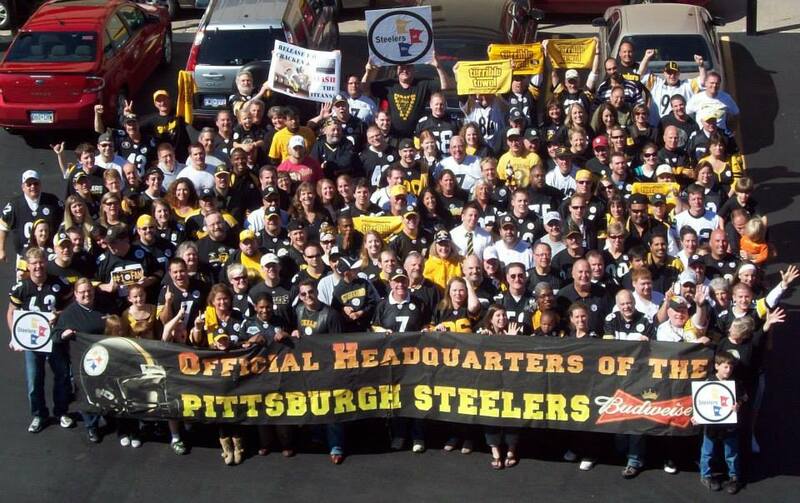 Most everyone knows everyone, it's become a Steelers family here. It's a family friendly atmosphere with all ages welcome. We never charge a cover to come to the games. We give away 20+ free Steelers prizes during halftime ranging from small items like keychains, & cowbells, to nice Steelers T-shirts, caps, sweatshirts and a celebratory Steelers shot every game! We do food drives supporting the Second Harvest Food Shelf. The club supplies Steelers jerseys as prizes for a raffle drawing for those donating to the Food shelf. This started out as a challenge competition between other fan clubs; Broncos, Bears, Vikings, Packers - but after crushing everyone for 10+ years no one competes with us anymore. We have a committee member who works to get matching funds for every dollar donated. We "self-fund" by having a Black & Gold bash at the beginning of the season with multiple Steelers items sold at Silent Auction to raise funds to buy the weekly prizes and fund the jerseys. We've been visited by former Steelers players - Tyrone Carter lives here and joins us frequently, and Josh Miller was here a couple of years ago while writing his book "Always a Home Game" and we are featured in his book.